I try not to put too much stock into weather forecasts. "I'll believe it when I see it," has long been my mantra when it comes to the weather.
" ... the Farmers’ Almanac predicts 'cold and very snowy' conditions for northern Missouri and northeastern Kansas. AccuWeather.com, a private forecasting service, puts Missouri and Kansas in a 'wintry battle zone' between the 'heaviest snow' to the north and 'not much winter' to the south." I've maintained this season that the fact the Vikings had to send players to Mississippi to convince Brett Favre to return for another season was the ultimate indicator of how things would play out in Minnesota. Tim Dahlberg said it all about Favre, Brad Childress and the Minnesota Vikings in his column this week: Desperate coaches like Childress don't last. ... Dan Shaughnessy had a good one about Favre a few weeks ago as well. I'm finished discussing Brett Favre. As we arrive and pass these annual milestones on the calendar, I’m repeatedly saying to myself, What a difference a year makes. We spent the Thanksgiving weekend last year at The Farm, agonizing until we were sick about the life-changing decision that lay in front of us. This year, as a result of that decision, we celebrated Thanksgiving in the Ozarks of Missouri. Kates and I didn’t have to go to work on Wednesday, and no one stirred in our house until almost 10 a.m. Which has to be a record for The Missouri Era. … Within a couple hours we had our bags packed and the car loaded. And we were leaving The ‘Ville. Funny, in Wisconsin everybody talks about "heading north" for vacations and holidays; now the popular phrase is "heading south." Little did we know we’d be driving through tornadoes to get there. We drove through not one, but two blinding, torrential rainstorms that I think are the new benchmark for Hardest Storms To Drive Through … Ever, beating out what became known as the Ingrid Michaelson Storm in Milwaukee last year. Again, I felt like I was navigating the Edmund Fitzgerald. … Somehow, Kates and I have a knack for finding such storms on our road trips, including the one we drove through a couple weeks ago to get to Kansas City. No fear. I blasted through the storm. And we made it to our destination just fine. After checking into our accommodations for the weekend, we reunited with my family at Joel and Stephanie’s new home. Some good old-fashioned Wisconsin brats for supper. While Phoebe and Sophia renewed their bond, watching Nickelodeon over plates of cut-up grapes and hot dogs. And Freddie just sat in his hi-chair and smiled. Endlessly. Thursday we slept past 8 and indulged in the hotel’s continental breakfast. Then Phoebe camped in front of the television in our room and provided the play-by-play of every balloon passing through the Macy’s Thanksgiving Day Parade -- from "Snoofy" to Buzz. I’ve never been a big fan of the holiday parades, but watching it this year with Phoebe added a new dimension to the annual spectacle. Outside, we had gone from 73 degrees the night before to 36 degrees, with a mixture of sleet and snow falling from the sky. Such is winter in Missouri. We were back at Joel and Stephanie’s for the afternoon. We watched football and conversed while Phoebe and Sophia ran laps in their Disney dress-up clothes and butterfly wings. One of the best things about visiting Joel’s and Stephanie’s house is their meals, and they delivered another delicious one for Thanksgiving. From the Ina Garten recipe book, they laid out a Thanksgiving buffet that included herb-roasted turkey breasts, green beans, cranberry relish, sweet potato casserole and pear-apple sauce. We were joined for dinner by member's of Stephanie’s family, and the room was filled with fun conversation. Eventually, the goodbyes began. We wished Mom and Dad safe travels as they were returning to Wisconsin the next day. … And we played a fun game of Are you staying, or going with us? with Phoebe. We had given her the option of having a sleep-over with Sophia, but she soon decided to come back to the hotel with us. Phoebe was asleep less than halfway into the five minute drive back to the hotel. Kates carried her limp body up to our room, and we laid her on the bed without a sound -- complete with the pink tutu she refused to take off when we left Sophia. I went downstairs for a dip in the hot tub, while Kates sat in bed reading. Friday, we maintained our morning vacation routine. Slept in. Continental breakfast. But on this morning, there was a brilliant sun shining into our room. After making ourselves look presentable, we were heading down U.S. 65 once more toward Joel’s and Stephanie’s place. In our strange upside down adult world, Uncle Joel, my little brother, agreed to watch Phoebe for the day, thus allowing Phoebe and Sophia -- the 2-year-old duo -- a full day of fantasy play and dress-up. … As usual, Phoebe clung to us and begged us not to leave until finally Kates and I distracted her long enough for us to creep through the door. As usual, we heard her screaming and running to the door while we headed for the car. By all accounts the screaming lasts only a few seconds before she’s off and playing, which is exactly what Joel texted to us a few minutes later as Kates and I drove to Branson. Without a kiddo in tow, Kates and I spent the entire day in historic downtown Branson, joyously walking the sidewalks, breathing the crisp fall air and slipping in and out of the stores that appealed to us. Kates got to treat herself to a Starbucks coffee and lovingly pulled me into one too many jewelry stores. Both of us hunted for treasures within the numerous antique store booths; holding us back, however, was our tight budget and the lack of permanent housing to inspire us. And all of the vinyl records that appealed to me were outrageously overpriced. But, for a glorified historic downtown, I couldn’t help but feel a little disappointed. Our trips to Stillwater, Minn., and Galena, Ill., seemed to offer so much more in scenery and variety. By late afternoon, we ventured down the hill to Branson Landing, a picturesque and modern outdoor shopping center in its own right. The atmosphere was bright and festive. A tall Christmas tree stood at the main entrance to the shopping center, Holiday music was blaring over loud speakers and the Landing’s trademark fountains were attracting eyes. … We explored a few stories in search of Christmas gifts, but came up empty. We never made it to the classic Branson strip. Around 5 p.m., we had had enough and decided we needed to rescue Phoebe -- or Joel, depending on your perspective. Back at their house, it turned out Joel had survived. He’d done just fine. … We downed some Thanksgiving leftovers with him and enjoyed each other’s company while the kids continued playing. Stephanie completed her workday and joined us later. The goodbyes began shortly after that. … We were halfway out the door when Phoebe stopped in her tracks and said with wide eyes, “Wait! I give Unco Joe a hug n’ kiss!” She whipped around, ran to hug him and planted one of her trademark open mouth kisses on him before rejoining Kates and I. For the second night in a row, Phoebe fell asleep less than halfway into our drive back to the hotel. Kates carried her to our room, and we laid her on the bed without a sound … I went downstairs for a dip in the hot tub, while Kates sat in bed reading. This morning we were packed and on our way back to The ‘Ville by 11 a.m. We cruised toward Kansas City and made a pit stop at a Flying J -- where we filled up on caffeine, Phoebe walked up and down the store aisles picking out snacks, and we met a trucker from Janesville with whom we exchanged our Wisconsin knowledge and connections. Around 3 p.m. we were nearing home and I was overjoyed to finally be within range of receiving the Bearcat football game on the radio. Lo and behold, our boys were trailing in the fourth quarter again, but staying within range -- a scenario we’ve witnessed the last four weeks and grew accustomed to long ago. In this afternoon’s playoff game, they were down by as many as 10 points with 10 minutes left in the game, but a ‘Cats touchdown closed the score to 31-28. As the minutes waned and our heart rates increased, the defenses held tight. With about four minutes in the game, the ‘Cats took the ball for a do-or-die possession and drove 80 yards downfield. They scored the game-winning touchdown with 17 seconds left, just as we’d arrived back in town and were traveling down Main Street. The silence in our vehicle was broken by loud cheers and pumping fists. Classic ’Cats football. A few minutes later we were parked in our driveway, waiting out the final seconds, a hail mary pass and confirmation that the ‘Cats won the game. Smiles abounded. “I guess we’re going to a football game next weekend!” Kates said. Kates and I can relate to the lyrics in these two videos. The first came to me compliments of my friend Trisha; I stumbled across the second in the related viewings ... which also included the epic "Swagger Wagon." Totally worth watching again. So our former home region was victimized by another rare tornado yesterday. This time it was a November day on which temperatures were in the 60s. I followed the whole thing from my desk yesterday afternoon as the Tweets, status updates and news reports dominated by TweetDeck. Really!? Again!? I thought. ... There's been a handful of them the last couple years. And anyone who was around during those freaky, and yet oh-so fascinating, January tornadoes, had to be thinking the same thing. Those were fun times. Hey – Happy Tuesday after a(nother) rare tornado. Rare tornadoes are getting boring. I had no idea the American Music Awards were last night. Kates and I didn't realize what we were missing until we began getting ready for bed, a few minutes before 10 p.m. mind you -- again, upside down. I turned on the TV to catch some of the local news and we caught the New Kids on the Block and the Backstreet Boys, or should I say NKOTBSB (Seriously!?) wrapping up the show with their spectacle of a performance. I might be more sad about missing the AMAs if every headline I saw about the awards today didn't have Justin Bieber within it. Between that and my absentee viewing this year, it's no wonder ratings were down. I’m in reflection mode again today. It was a year ago today that I hopped on a plane for Missouri for a whirlwind tour of The ‘Ville and flew back to Wisconsin that night. I had received the call for the interview a couple weeks earlier, from an administrative assistant who explained to me the interview had to be Nov. 17, a Tuesday. No other days would work. Fortunately, I had one vacation day left for the year. The problem I faced, though, was getting the day off approved. My employer had a policy that vacation days had to be requested at least three weeks in advance. So I tried trading for a day off with a couple co-workers. When that didn‘t work, my only hope was to tell my editor “something came up” and hope he agreed to give me the day off. Luckily, he did. No one at my workplace knew why I needed the day off or where I was heading except for a close friend, my partner in crime on the 5 a.m. shift. Outside of work, only Kates, our parents and a couple more close friends were aware of my travel plans. I arrived in Kansas City during the late morning hours, picked up a rental car and headed to The ‘Ville, where it was colder that day than it was in K-Town. The ‘Ville also was getting its first of many, many snowfalls last winter. Compare that to today’s weather: sunny, clear and mild. I grabbed a quick lunch at a Taco Bell and then took a drive to explore the town. Kates also had scouted the real estate online and gave me a list of addresses she wanted me to review. One of those houses turned out to be the first one we toured when our house hunts officially began last spring. Another, now known as No. 29, was a house we’re still pining over but are weary of its location. Then at around 1:30 in the afternoon, I was heading to campus and finding my way back into the Administration Building. Up the grand staircase and toward the east wing. To the university relations office. Where I got reacquainted with Gina, who I’d soon be referring to as the office glue and who offered me unbelievable support and assistance from that day on. Around 2 p.m. I was sitting around the conference room table with Gina and the rest of the players who within a couple months would become my trusted coworkers and friends. I could tell that day they would be an awesome team to work with. Another interview followed with a group of professors and administrators. Looking back and thinking about the people around that table, just like the people who were in that first interview, it’s amazing to think about the roles each of them have played in my first year. When the interview process finished around 4, I began my walk out of the Administration Building. I'll never forget walking down the grand staircase, seeing the students bustling through the main corridor and thinking, This is where I want to be! Soon I was driving back to Kansas City to catch my flight back to Milwaukee. I caught it, and after a busy, mentally-draining day, arrived home shortly after 10 p.m. I’ll never forget the image of coming through our door to find Kates sitting on the couch, waiting for me, grading papers and anxious to hear about my day. I was confused and unsure at that point. The next morning, Rob Thomas sang to me when I started up my car. I was back at work at 5 a.m. the next morning. A week later, I was offered the job. A week after that I accepted it. And the adventure began. I, too, watched the Twitter-verse explode this morning with excited Tweets about the Beatles catalogue finally being available on iTunes. For more of the story click here. "This isn't for the die-hards. We bought the revamped stereo CD reissues a year ago. ... What you don't hear is the kind of gushing that accompanied last year's reissue of the entire Beatles catalog in its first major upgrade/ remastering since 1987. Then, the talk was all about the immediacy of the recordings, how you felt like you were in the studio with the band." Pretty much. That was fun. Hence, my ultimate Beatles playlist. 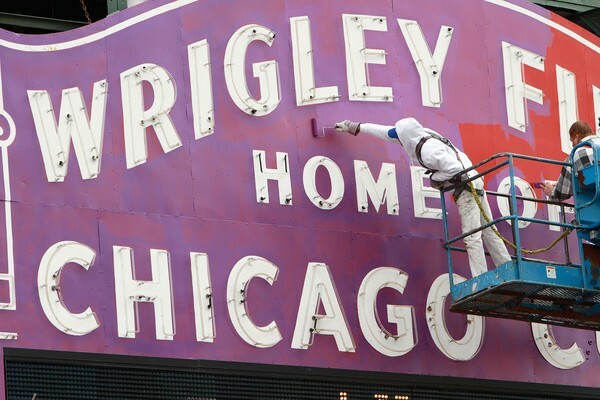 Painting the classic red Wrigley Field marquee purple, on the other hand, just seems very, very wrong. Here are a couple good reads about the "unique" football game played at Wrigley over the weekend ... I'm sorry I missed it. 38, 39 … and lucky No. 35? In case you were wondering, yes, we’re still looking for a house. We resumed the hunt once more last Sunday, after going to church and indulging in the brunch buffet at the student union. On the outside, House No. 38 had immense charm. An older home with fresh red paint and white trim. A large front porch. A two-car garage and a second one-car garage that was set up as a spacious workshop. And it sat on two lots, leaving Phoebe plenty of extra room to run and play. Then we stepped inside. The blue carpet throughout the home was stained and filthy, and we found no signs of hardwood flooring beneath. Every wall in the house was covered with dated, floral print wallpaper -- in various shades of blue, of course. The kitchen was spacious, but it was connected to the formal dining room by a narrow hallway and maze of cabinets. Upstairs, the bedrooms were tiny. 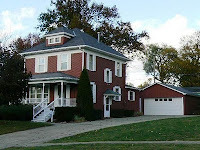 Outside, although the property consisted of two lots, the house sat awkwardly on a corner lot, leaving enough room for a small back yard adjacent to a street that ran west of the south-facing home, and the wide open lot to the east. It would have been far more ideal if the open lot connected to the back side of the home, creating a huge back yard. And that two-car garage -- we could see daylight through the settling concrete blocks. Bring on House No. 39. Another nearly century-old home. 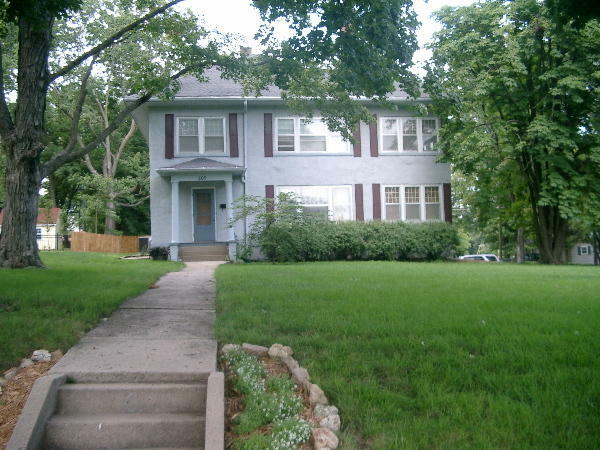 It sat on a corner in a neighborhood near campus that is loaded with beautiful historic homes. The home is set far from the road, creating a long sidewalk leading to the front step. The home’s tall, thin makeup and gray stucco exterior also conjured up thoughts of some haunted house straight out of a Scooby-Doo episode. The fact that we were toured it in the darkness of night might have had a lot to do with that. Inside, many of the home’s features were breath-taking. Gorgeous hardwood floors. Large rooms with 9-foot ceilings. Built-in shelves and a fireplace in the living room. Ornate, original windows. And sun rooms on the first and second floors that would were so inviting, I think Kates and I both had visions sprouting from our heads of lying in chairs and reading books on sunny Sunday afternoons. In a lot of ways, the interior of the home reminded me of something from the movies. Like those Manhattan apartment interiors you see in so many romantic comedies. I’m thinking of “You’ve Got Mail,” or “One Fine Day.” As we got into our car afterward, I said the home, arguably, was my favorite of all the older homes we’ve toured. But. Like all of the older homes we’ve toured, it needed its share of repairs and upgrades. Most notably, in this case, the upstairs walls were showing severe cracks. The one-car garage, located at the basement level, was a let down. And Kates and I shuttered to think what it might cost to heat and cool the monstrosity. All of that brings us back to House No. 35. The house that has been head and shoulders above nearly everything we've seen so far. The house that is so close to everything we've been looking for. The house that is so complete, it makes us feel ashamed that we grieved so heavily over our offers that didn't pan out last spring. Unless a more perfect home presents itself. Which could still happen. Amid all of the change and tumult in our lives these last few months, Saturday afternoons have been a bright spot. Because they mean (cue the Monday night football theme music) … Bearcat football. I could go on and on -- and on -- about the lure and charm of it. And why Division II is better than Division I. … The game day atmosphere. The tailgating. The marching band. Bobby the mascot and the cheerleaders. The lack of ego and money-grubbing executives looking for anyway to make a buck off star athletes. Not to mention our powerhouse football team with a legacy that’s unmatched over the last 15 seasons. As I’d hoped when we made the move here, Kates -- though she won’t admit it -- and Phoebe have been sucked into it the way I was 13 years ago. Trekking to the stadium on Saturdays is now a family affair. Saturdays are game days. Even during the weeks when Kates thinks she’s not up for a game, Phoebe is the one to push her over the edge. It never fails, mid-week Phoebe declares “I go to da Bearcat game this weekend! ?” And Kates can only smile and give in. … Phoebe has a huge crush on the mascot after all. 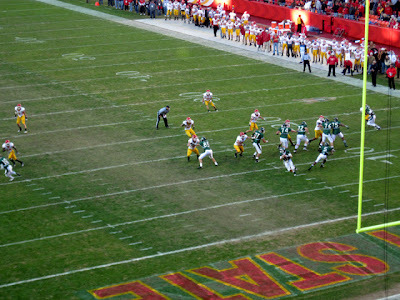 Such was the case this weekend for the big game at Arrowhead Stadium in Kansas City, an annual game dubbed “The Fall Classic” that the Bearcats play against a conference rival. Kates was on the fence, but Phoebe made a mention of going and we couldn’t deny her. We booked a hotel for Friday night, I got my hands on some tickets and our plans were made. Friday afternoon, I picked up Phoebe a couple hours early from daycare. When I stepped through the door, she spotted me and ran toward me squealing, “I go to Bearcat game!” I’m so proud of her. I met Kates at our place. We loaded the car. And soon we were going to Kansas City. The only problem was the beautiful fall weather we’ve been enjoying suddenly turned ugly. The temperature had dipped into the 40s and we left The ‘Ville in a fog. As we neared Kansas City and converged with the rush hour traffic, the light rain turned into a monsoon. We found our accommodations across from the stadium complex, checked in and then I got the pleasure of unloading the car in the cold hard rain. Once Kates and Phoebe were set up with my laptop -- they spent the night watching movies in our hotel room -- I headed to the car again, and then downtown for our pep rally at the Power and Light District. Despite the horrible weather outside, the atmosphere was awesome inside. 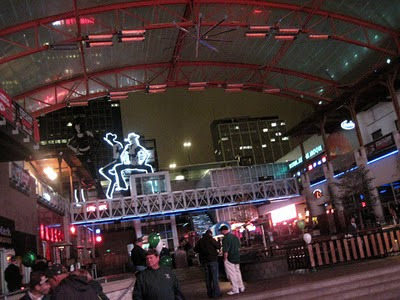 The Kansas City skyline was illuminated around the open-air pavilion, but an awning overhead protected us from the rain -- and the heaters throughout the pavilion made the air feel like a balmy 60 degrees. Saturday was game day. By the time the stadium gates opened at 10 a.m., there was already a long line of vehicles, sporting their teams’ colors, jamming the road. In the meantime, we headed across the street for a breakfast at Denny‘s. The real fun began once we parked at the stadium around 11. Cars adorned with Bearcat flags and fans clad in green sweatshirts and jerseys filled the lot. Along with the smell of burgers on charcoal grills. We headed for the alumni pavilion to meet up with my office mates and help greet fans as they streamed inside. Phoebe wasted no time catching the attention of everyone she passed, and really made a splash when the mascot, Bobby, visited the pavilion. Fearless, Phoebe proceeded to take him by the hand and led him from one end of the Pavilion to the other. … It was absolutely adorable, and god bless the student underneath that costume for being so patient with her. When the band finished, we headed inside the stadium -- where we enjoyed the royal treatment. Before yesterday, I’d been inside Arrowhead Stadium just twice in my lifetime -- once for a Chiefs-Saints game during the Steve DeBerg era, and we sat in the nosebleed section. 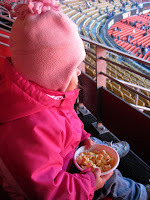 The other was for a Chiefs-Bills game during my infamous concession-man experience. This weekend was an entirely different experience. Arrowhead underwent a major overhaul during the offseason, and our office acquired one of the stadium’s suites for Saturday’s game. After passing through the turnstiles, we boarded an escalator that took us to the suite level. Cherry woodwork and gold-patterned carpet highlighted the sleek design, and the wide-open atrium areas outside the individual suites were naturally lit with exterior walls made entirely of large windows. 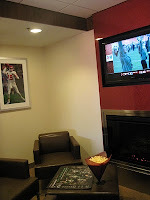 Then again, I’ve never been one to get too enthralled with the whole suite atmosphere. Like that Miller High Life commercial where the beer man lambasts some suite dwellers "in section la-di-da" at a baseball game. For me watching a game from inside a suite is no fun. 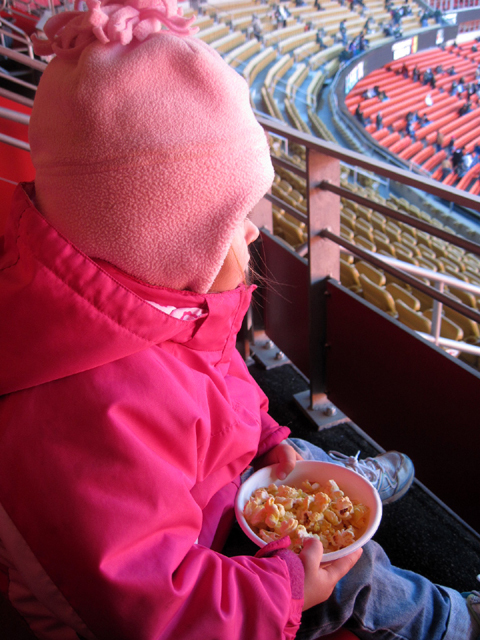 All of that, of course, was a bonus to the excitement of watching our team play in an NFL stadium. Under a huge scoreboard. Surrounded by a bowl of seats filled with thousands of fans. All Phoebe needed was her popcorn and she was set. The game started as a blowout and then turned into a nail-biter. With our team ahead 20-3 at the start of the fourth quarter, the opponent drove 80 yards for a touchdown -- but we blocked the extra-point attempt and returned it for a two-point conversion. Another opposing touchdown made the score 22-16, and then our rivals marched the ball to our team's 12-yard line with less then 30 seconds left. Our defense didn't budge, though. The final minutes had all of us sitting on the edge of our seats, literally. And breathing a major sigh of relief when time expired with the ‘Cats still on top. 22-16 was the final score. We joined the swarm of fans leaving the stadium and then waited oh-so patiently as the car-jammed parking lot thinned out enough for us begin our drive home. Phoebe, who rarely stayed in one place and enjoyed her game day experience to the fullest, was asleep in car seat before we left the parking lot. We have a full-fledged 2 1/2-year-old now. We're in the throes of the terrible twos. ... Though, I'd like to think we've reached the peak and the worst is over. At this stage, she's grown into such a complex little creature, it's hard to know where to begin. Parenthood, thus far, has been everything I imagined it would be -- and a whole lot more. One moment we're using our last nerves in a struggle to convince her to put on her coat; the next she's sitting sweetly on the couch and talking to her baby doll with a toy bottle in one hand and her baby's blanket in the other. Her tantrums are both torturous and hilarious. She shouts “No! I don’t wan-it” -- even though she probably has no idea what she wants at all. And then -- like the flip of a switch -- something will distract her enough to make her the happiest 2-year-old in the world. No, after all, is her favorite word these days. We could offer her ice cream, and she’d reply with a snippy, punchy “No!” Just because she loves to use the word and wield whatever toddler power she may have. ... Her other weapon of choice is a random nasally scream. Meeeeeeeeeeh! Sometimes the hardest part is keeping a straight face when we have to discipline her for doing something wrong. When she whips out that pout, its almost always over for me ... A few weeks ago, we forfeited a Sunday morning at church because we had to deal with a Phoebe fit. The standoff ended eventually when I broke into a laughing fit. Unfortunately for me, Kates didn't think it was so funny. The good news is all of us have grown a lot since our adventures of the summer ... Those first few weeks of leaving Phoebe at her new daycare were so discouraging we might have quit our jobs to stay home with her. Now, she barely takes time to say goodbye to me when I drop her off in the morning before running off to play with the other kids in her class. Phoebe is so smart. And stubborn and independent. Just like her parents. She has a mind of her own, and if she doesn’t get what she wants she lets everyone know about it. Our poor neighbors. Then there's the sleeping. We moved her from her crib to a bed almost immediately after our move in July, and the switch was going swimmingly. Until fall arrived. During the month of September we could count on middle-of-the-night visits from Phoebe every few nights. The trend got worse during October with Phoebe paying visits to our bed almost nightly. It got to a point that we set up blankets and pillows at the foot of our bed, knowing that once she woke us up and drank some milk to calm herself she'd crash on the blankets and sleep until daylight broke. Add to that the marathon that is getting her ready for bed. The bedtime ritual usually begins between 7 and 7:30 at night. But after brushing teeth, reading stories, singing songs and saying prayers, we’re lucky if she’s asleep by 9. The whole ordeal leaves Kates and I wiped out and too tired to do much of anything else most nights. Putting Phoebe to bed is arguably the most exhaustive part of our already loaded days. Thankfully, we might have finally nipped the 2 a.m. wake-up taps in the bud by installing a “magic gate” at Phoebe's bedroom door this week. Or I could just tell you we retrieved the baby gate from storage and put that in Phoebe's door. Naps are another story, and luckily Kates and I only need to worry about those during weekends. ... There are some days that she is too tired to stand, let alone fight us over a nap. Then there are the days like a recent Sunday afternoon -- before we installed the "magic gate" -- when she repeatedly climbed from her bed and appeared giggling before me upstairs. At one point that afternoon, as I listened to the monitor, I heard her rustling and the music suddenly changed from a set of Baby Einstein lullabies to Stacy Orrico's "More to Life" blaring through the speaker. She had figured out how to switch the music on the iPod and crawled back into her bed where she sat smiling when I made it to her room to check on her ...What can I say? She understands technology, too. She turns on the DVD player and starts movies by herself all the time. Phoebe certainly has made it apparent that she likes music, especially the classic and indie rock Kates and I enjoy so much. Few genres seem to get more of a rise from her, and rarely a day goes by that she doesn't ask me to "turn the music on" as we're driving to the daycare. Lately, Phoebe's also has had a heightened interest in the rock 'n' roll playlist I created for her at birth, and while there's never a shortage of impromptu dance parties at our house we had one for the ages as we watched the Packers-Cowboys game Sunday night. Phoebe announced she wanted to dance and she wanted the "party" playlist. So we turned it on for her and a rollicking dance party ensued that covered nearly every corner of our living area. There was a train and jumping and skipping around all of the rooms, while we waved the green and white beads we've accumulated this fall at Bearcat football games. The dancing went on for a good half hour. It was a fantastic diversion to our troubles. And Phoebe doesn't just do rock music. It's not out of the ordinary for her to break into singing "Itsy Bitsy Spider," "Five Little Monkeys Jumping on the Bed," "Five Little Monkeys Swinging in the Tree," "Twinkle, Twinkle," or "Wheels on the Bus." Or the theme song from "Elmo's World." Loudly. Her favorite pastimes continue to be coloring, stacking blocks and playing with cards -- her matching game, Uno, Phase 10. Doesn't matter. She just likes looking at the cards and reciting the animals, colors or numbers on them. ... Recently she's also begun a habit of putting every card, figurine, cup, plastic food item, and whatever else she can find into a bucket and carrying it around like a purse. Her favorite things to watch are Mickey Mouse Clubhouse, Sesame Street videos particularly the 40th anniversary DVDs we acquired last Christmas -- which during the segment of highlights from the first season features a counting bit that includes a chef falling face-first down a staircase with a wedding cake; the first time we watched it with Phoebe she got so upset at the sight of the cake crumbling into a million pieces that she cried -- and "Jonah ," and relentlessly, "Toy Story ." ... Thankfully for my sanity, her interest in Barney videos has waned. Still, she's watched some of her videos so often that she we're now catching her reciting the promotions that appear before the feature presentations. We also introduced her to "Monsters Inc ." a few weeks ago after Kates found it at the local library, which, in Phoebe's eyes, stands as a place to get movies, not books. it was no surprise that she adored "Monsters Inc." and watched it nearly non-stop for the week we had it. Although, the first few minutes of the movie were always too scary for her to watch alone; she always wanted to sit with Kates or I -- until Boo showed up. Then she was cool. She gets excited about washing her hands. Because it means she gets to pull the step stool away from the wall, drag it into the kitchen, set it up in front of the sink and climb on to it. She loves opening sandwich cookies and eating the frosting first. "Daddy, pwease open it?" she asks, thrusting the cookie into my face ... She also refuses to drink her milk unless we warm it in the microwave first, which I think is just plain weird. Like most toddlers, apparently, she delights in running around naked after her baths. She loves to play "tricks" with her tongue. She delights in giving and receiving high-fives when she does something well. She still loves talking on the phone -- only now when we give her the opportunity, she takes it to another room to talk gibberish to the victim in private. We’re not potty training officially, but she’s showing more interest in using the toilet -- when she thinks of it. Most of the time we just catch her bracing herself against the coffee table or the refrigerator, to which she acknowledges “I’n working on some-ting.” … Although, she’s figured out she can also use that as a stalling tactic. That strategy becomes apparent when you approach her and she runs away shouting, “I’n working on some-ting!” … The best way to tell if she truly has a dirty diaper is to tell her to sit down. If she needs a change, she says, simply, “I can’t.” … “Why not, Phoebe?” … “I poopy.” We'll begin potty training in earnest in January. She can spell her name out loud. Ask her to write it on a piece of paper and she makes a series of hash marks with her crayon. Kates and I also have noticed more lately that Phoebe needs a playmate. We'll see about that. We can barely keep up with Phoebe. We've said she's a ham almost from day one -- there are days I think Phoebe and her uncle Joel are going to get along extremely well when Phoebe's a little older -- and she cracks us up every day with her eye rolls, whimsical comments and observations on life. "Pwease have my ladybug so I can get it." "Hey everybody, look at me! I got my shoe in my hand!" "Mommy?" ... "Yes, dear?" ... "I'm not a deer! I'm Phoebe!" "My cookie fell down." ... "Where?" ... "In my mouth so I ate it." (At daycare, as told by one of her caretakers) "Phoebe's jumping. She said, 'Paige, I jump.'" "Daddy, pwease don't drink dis, ok?" She is indeed one-of-a-kind. And we love her more and more every day. If you're a young parent, you might understand. Otherwise you can go throw up now. I love me some "Wheel of Fortune." One of the points of pride for The ‘Ville, and one of the things that helped convince us to make our move, was that it’s a small community with a city feel. Thanks to the university, there is no shortage of cultural events and excellent entertainment. Ok, so we’d be a lot happier if there was a Target in town. And an Arby’s. But we’ll take what we can get. Last night, while Kates and Phoebe went to a friend’s house for “a little girls party,” I indulged in the entertainment. My first concert experience in what has seemed like an eternity, and oh, it was good. The Hunt Family. They’re not a household name -- as evidenced by the two people who raised their hands last night when one of the band members asked how many audience members had heard of them -- but after seeing them perform last night and listening to more of their music today, I’m a little perplexed as to why they’re not. Think of the von Trapp Family, but with fiddles. A modern, made-for-the-digital-age, countrified version. They’re a family of nine -- Mom, Dad, twin girls and five boys -- whose music ranges from Celtic to bluegrass to country to rock. And they mix their champion fiddling with Irish step-dancing, which to my delight was kept to a minimum last night. With the twins, 21-year-olds Jessi and Jenni, and their gorgeous harmonies carrying the load, I could have sat back and listened to the group’s original songs all night long. I'm a sucker for good female vocals, after all. Individually, their soft tones reminded me of Adele or Ingrid Michaelson; together the girls could draw comparisons to the Dixie Chicks. Their hour-long show last night spanned Jenni Hunt’s slow, heartfelt “Friend” about two straight months on the road and missing loved ones back home (I can relate to that one ...), to Jessi Hunt’s upbeat and delightful “Apple Tree.” It’s so singable, I can’t get it out of my head today. There were other highlights, too. Like Jonathan Hunt’s keyboard-banging instrumental “Crazy Fingers” (think Tran Siberian Orchestra). And there was a rousing Irish dancing number that had the boys, wearing white shoes and white ties, illuminated in black lights as they tapped and stomped on the stage; then they switched to drumming on the stage with glow-in-the-dark drumsticks. There also was a charming portion that featured the kids shoulder to shoulder and playing the fiddle of the sibling to his or her left. Fittingly, the Hunts capped the performance with their take on the classic “Devil Went Down to Georgia.” To say the crowd left the theater smiling is an understatement. Afterward, the family appeared for a meet-and-greet, and I wasted no time plopping down some cash for a CD. Moments later, the jacket was signed with all nine names, and I’ve got another warm concert memory to add to my treasure trove. I'm having a little trouble accepting the fact that the baseball season is over. I never would have imagined the San Francisco Giants would be crowned World Series Champions. But their pitching was so dominant the Rangers’ fate was sealed after Game 1. It was sudden. And Edgar Renteria. World Series hero. Again. ... Beyond this dramatic home run, this was the stat that really got me when it was mentioned after the game last night: He joins Lou Gehrig, Joe DiMaggio and Yogi Berra as the only players with two World Series-winning hits. And whaddaya know -- I turned on the TV tonight and discovered the ESPN Classic was airing Game 7 of the 1997 World Series between Renteria’s Florida Marlins and the Cleveland Indians. I’m watching it now. And I’m as captivated as I was when I watched it in my college dorm room on that Sunday night in October 1997. I’ll never forget furiously e-mailing my dad after every dramatic turn of that game, and then having him ask me the next morning, after he'd logged onto the computer and seen all of the e-mails, if I was feeling lonely the night before with no one to talk baseball. See, the simple phone call was already losing ground in those days, and Skype, Facebook or Twitter were still 10 years away. And I'll never forget burying my head in my hands when Renteria hit his first game-winner to score Craig Counsell -- because I had been rooting desperately for the Indians. Game 7 of the '97 series is arguably my favorite world series game of my lifetime. In one of my favorite world series of my lifetime -- 2001 and 2002 being two others. Featuring one of my favorite teams of my lifetime, the 1997 Cleveland Indians. Sheesh, both teams in that world series were stacked. And it blows my mind to watch the game now, to see guys like Jim Thome, Matt Williams, Craig Counsell, Moises Alou and Jim Leyland. And to think about how I’ve enjoyed tracking their careers. Final note: The NBC broadcast, led by Bob Costas, just showed the longest world series title droughts -- as of 1997, mind you. The list, starting with the longest, looked like this: Cubs, White Sox, Red Sox, Indians, Giants. ... Very interesting. The White Sox, Red Sox and Giants have since won, and the Indians, at the least, made the World Series in '97. The Cubs ... yeah, still waiting. 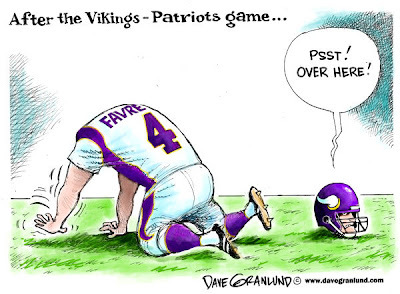 Speaking of interesting, how 'bout those Minnesota Vikings? The Brett Favre/Randy Moss/Brad Childress drama just keeps getting better and better. That the Vikings released Randy Moss within a month of acquring him is laughable, and it's only going to get worse until Childress finds the guts to bench Favre, who clearly isn't helping the team with his broken down body. That's my rant and I'm sticking to it.